Unsettling the Archetypes: Femininities and Masculinities in Indian Politics asks several key questions. 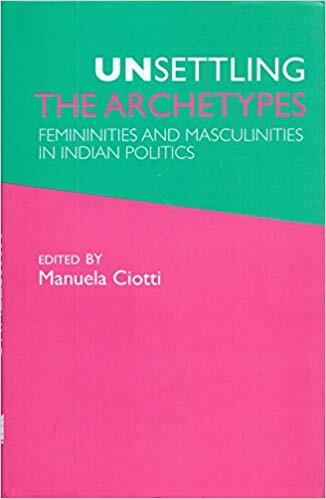 How have the archetypes for femininities and masculinities been reshaped in Indian political history and in the present? Categories: Women Unlimited, Politics, Reference, Social Sciences, Sociology and Anthropology, Women's Studies. Tags: Women Unlimited, 9788188965960, Empowerment of Indian Women, Indian feminism, Indian politics, masculinity, Position of Women in India, women's rights. Unsettling the Archetypes: Femininities and Masculinities in Indian Politics asks several key questions. How have the archetypes for femininities and masculinities been reshaped in Indian political history and in the present? How have the practises and subjectivities of non-elite individuals and communities contributed to the production of alternative self representation? What does a focus on the linkages between materialities and ideologies reveal in such an inquiry? standpoint of longstanding issues within Indian society, history and culture. An expression of multiple temporalities and diverse regional contexts, these issues range from the nationalist movement for independence to the career of the Women’s Bill in Parliament; violence in Hindu-Muslim relations; meanings surrounding the body; the life of history textbooks; and forms of activism among Dalit communities. and masculinities across political time and space. They compel the readers to move beyond known frameworks and to expand the existing repertoire of possible selves, while unsettling their order.